“We’ve doubled our turnover since switching to Bizink 4 years ago. 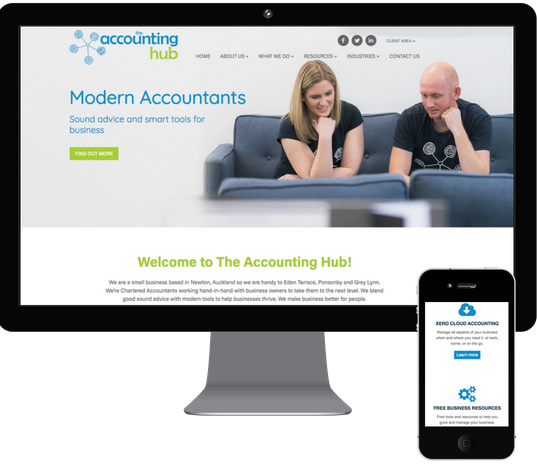 Our website has been an important part of that growth.” – The Accounting Hub’s Bizink experience. While working at a large Auckland chartered accounting practice back in 2011, Andrew Millington was given the task of reviewing new accounting software. It was an eye-opening experience seeing the possibilities that were opening up with Xero and the cloud. Within a year Andrew started his own accounting business, The Accounting Hub, focused on using the latest technology to help clients achieve success. “We had a couple of websites before we moved to Bizink, but they weren’t mobile friendly,” Andrew said. “We are pitching to clients that we are up to speed with technology, so we needed to have a website that reflects that.” Andrew says. Bizink also offers existing website clients a design upgrade, free of charge. “We recently had a website design upgrade which was really good. We wanted our testimonials to be the focus so they are now the feature of the home page. It was a smooth process and it looks really good!” says Andrew.